Supposedly, summer officially started last week. Someone clearly forgot to tell Vancouver, because it’s been wet wet wet for the last few weeks. People have taken to calling it ‘Juneuary.’ It’s a name that makes you chuckle for a moment when you first hear it, until that next moment when you realize oh no, it’s true. There’s some implicit hope in that name at least, that the true spring will follow soon enough. ‘Junetober’ would be far more depressing. As a result of all this wet, crops all over the lower mainland seem to have been a bit slow to start. The folks at UBC farm only just started their Wednesday and Saturday markets last week, and with all the flooding in the valley last week, which ruined crops and set a number of farmers months behind schedule, local veggies may be harder to come by this year. Lucky for Dave and I, we signed up for a CSA box from the farm this year that should keep us pretty well buried in vegetables until October. We received our first box last week, and it was full of tasty green things: spinach, kale, mesuna and ruby streak mustard greens, mint, green onions, and pea shoots. The pea shoots were perhaps the item I was most excited to see, and so on one of our currently rare sunny evenings I used them to make this risotto. In my mind, this dish is quintessnetially linked with spring. It’s light and refreshing, and also comforting, which makes it perfect for those more typical spring days that cannot decide if they want to be sunny or rainy or both. These qualities come from the fresh pea shoots, stirred in right before you eat so that they retain their crunch and full flavor. Strictly speaking, the pea shoots aren’t absolutely necessary. 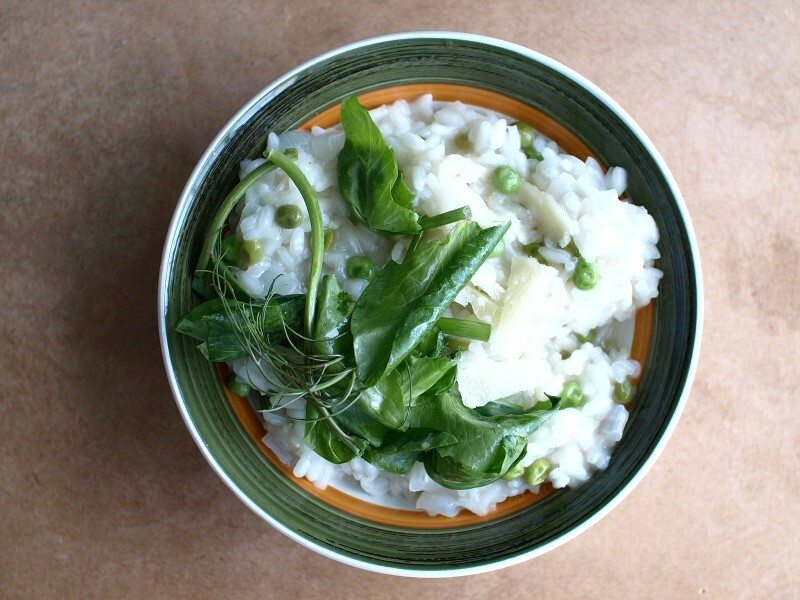 You can make a delicious risotto with just the peas, but the pea shoots make this dish extra special. I am always surprised when I read that people find risotto intimidating. I’ve always enjoyed making risotto. It takes more constant attention than a lot of other dishes, but that’s balanced out by the fact that there’s typically very little prep involved. And for that 20 minutes or so of stirring there’s nothing else for you to do but relax, maybe listen to the radio, and reflect on your day. Heat the soup stock on the stove in a medium saucepan. It needs to be hot, but not boiling. Add the peas to the hot stock, and let them just cook through – you want them to keep their bright green color. Remove the peas with a slotted ladle and set aside. Use a large bottomed saucepan or a frying pan with high sides to make the risotto. Over medium heat, saute the onions in the olive oil until soft, but not brown, about 5 minutes. Clear a space in the middle of the pan and add the diced garlic to cook for just a minute. Next, add the butter to the center of the pan, let it melt completely, and then stir in the rice to coat it with butter. Now the stirring starts. Keep the rice moving just enough so that it doesn’t stick to the bottom of the pan. Cook the rice until it start to turn translucent, about 3-5 minutes. Next, add the wine and stir until it has been totally absorbed by the rice. Begin adding the stock a couple of ladles at a time, and gently stir the rice until the stock has been absorbed. Repeat this process until the rice is cooked, but still al dente, about 15 – 20 minutes. You’ll likely use all the stock. 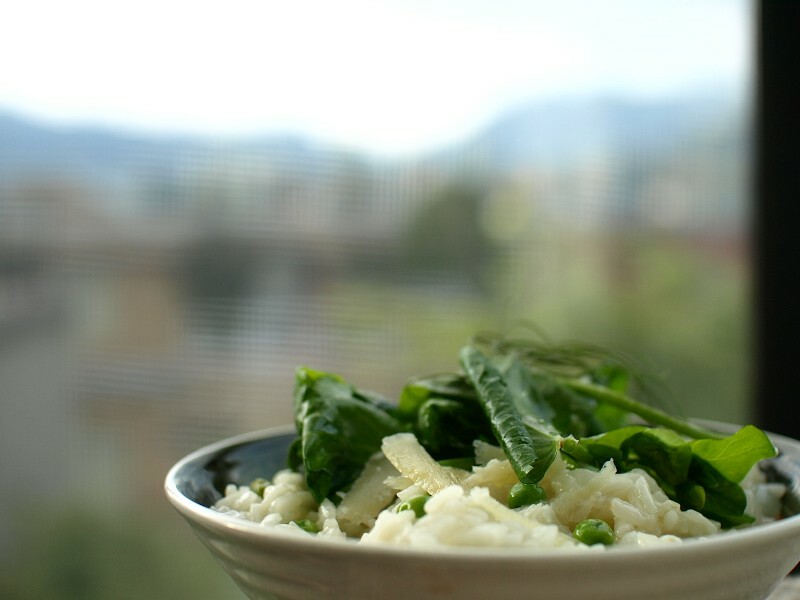 Remove the risotto from the heat and stir in the peas, parmesan cheese and parsley. Cover and let rest for 5 minutes. Serve in bowls, with a big pile of pea shoots on top, along with and some slivers of parmesan cheese. Serves 4 as a main. Note: Another tasty variation on this recipe, which requires only slightly more work, is to make your pea shoots into a pesto to stir into the cooked risotto. Combine half the pea shoots, 2 tablespoons of olive oil and a bit of lemon juice in a blender or food processor, and blend until smooth. Stir in the pesto at the same time that you add the parmesan and whole peas. You are currently browsing entries tagged with pea shoots at Perpetually Astonished.